It’s time for a true cycling league. The inside spin on cycling these days is all about its broken business model, particularly in the United States. Fred Dreier, the well-respected pundit at VeloNews recently posted some spot-on observations about the current challenges facing the sport: VeloNews: Dark Days for Domestic Peloton. Even though the doping shadow is fading and general interest in cycling is up, organized road racing in particular is facing a grim reality: less money for teams, fewer big events, fewer opportunities for riders and dwindling newcomers to the sport. So what’s the solution: Try to fix a broken system or create a new one? The answer is BOTH. According to recent surveys by the Outdoor Foundation, over 40 million Americans annually participate in some form of bicycling, more than golf and tennis combined. That is a substantial core audience. Plus the number is growing through the proliferation of bike paths, Grand Fondos, charity rides and indoor cycling platforms like Peloton and Zwift. No question that gold medal winners and World Tour riders develop from encouraging and growing bicycle racing competition, which includes tapping that huge participation base, finding and funding talent as well as promoting and safely sanctioning all types of cycling races. There is also a growing base of new sports fans, millennials and others that demand short, fast action entertainment including the ability to get inside the competition, teams and athletes, even if they don’t themselves participate. Why hasn’t USA Cycling and others promoting the sport in the U.S. been able to make bicycle racing, arguably one of the most popular sports in the world, more relevant on the U.S. sporting scene? After all, aren’t we the country that led rise to the PGA, USTA, NFL, MLB, NBA, and NASCAR; spawned super athletes and fostered the creation of recent financially successful “emerging sports” like Street League Skateboarding, Professional Bull Riding and the UFC? In fact, two of the most recent innovations in cycling originated in the U.S.: Mountain biking and BMX. The big mistake we continue to make in United States cycling is the assumption that what has made the sport popular in Europe can be sold to the American public, despite the fact that Euro-centric tradition is at the heart of the current sport’s DNA and cycling plays to an imbedded culture that has flourished abroad for over a century. Do American promoters think they can fix cycling by creating more Tour de France and European type events? Although they were great and well-executed events, it didn’t work so well with the Tour de Georgia, Tour of Missouri and USA Pro Cycling Challenge (Tour of Colorado). They were all stage races that disappeared after a few years from lack of public and sponsor support, poor TV ratings and the enormous costs of staging and televising road races over public roads that tend to anger as many people as they inspire. Even the huge one day events we created and ran in the centers of Philadelphia, Pittsburgh, New York, San Francisco and several other cities fell victim to escalating permitting costs, sponsor ups and downs and the increasing segmentation of media outlets. At least the current Colorado Classic is testing a new formula by incorporating a Velorama music festival and other innovations in an attempt to lure new fans and the Amgen Tour of California has a deep-pocketed backer that is able to sustain annual losses. Cyclo-cross, that most European “off-season” version of the sport is at least gaining traction here, no doubt due to the less disruptive nature of its venues and tradition of in-your-face fan engagement. And then there’s track cycling, the one aspect of the sport that has true American roots as one of the earliest forms of sports entertainment. Now it gains mainstream public exposure only because it’s included in the Olympics. But our Olympic track cycling qualification program is basically unknown and is only available to track racing specialists who, mostly on their own, can achieve international time standards? No wonder we only sent seven track riders to RIO out of a possible twenty positions. At least winning performances by our women team pursuiters have resulted in some redirecting of funds into track racing for the next Olympic go round. The recent world class performances by U.S. riders in the PanAm Championships illustrates the effectiveness of elite program funding. It’s a very promising development as we head toward the Tokyo Olympics but, on its own, won’t sustain the audience needed to create an ongoing fan base and greater participation. I argue that it’s time to go back to our American roots of ingenuity, invention and out-of-the-box development. Don’t get me wrong, noble attempts to improve road racing, better define criterium circuits and throw money into development of elite track riders are all critically important. But so is a truly innovative and some would say, disruptive, approach that brings the best elements of successful modern sports and business to cycling. The answer is hidden in plain sight: track racing. No other cycling discipline has these key ingredients: Controlled racing environment, ideal television potential, multiple revenue options (including gate receipts), thrilling non-stop action right from an arena seat and the potential to create a sustainable league format. Plus velodromes offer a relatively safe gateway to bring thousands of youngsters into the sport and teach them important fundamentals for all cycling disciplines. Just ask Lawson Craddock, Geraint Thomas and so many other top pros who began their careers on the track. But track racing, particularly in the U.S., has to make big changes to draw new fans. Will this come easily? Of course not. It takes assembling a brain trust of business leaders and sports visionaries to make it happen. The kind of people who have turned those “non-mainstream” sports like Street League Skateboarding, Professional Bull Riding and Ultimate Fighting into multi-million dollar sports properties. Of course there has to be a deep understanding of cycling in all its forms but it is critical to combine an appreciation for the nuances of the sport with solid expertise in the things that make other sports successful: Quality athletes with unique persona, exciting action and ever present risk, formats that captivate and hold viewers, and quality relationships with sponsors and all forms of media. Most important is creating, distributing and monetizing the “insider” content that today’s sports viewers demand. That means on-bike cameras, insight into conversations between athletes and coaches, downloaded analytics from the riders like power output, heart rate, pedaling cadence and more—all things that can be presented in real time on second screens and mobile devices on demand. And then there is the challenge of continuity. By learning from other successful sports, that translates to a league format with region-based teams, easy to follow standardized events, a fast-moving program and a defined season that builds toward playoffs and finals, ideally between September and April to capture additional talent from the road. Last but not least is the need for proper venues. We’re talking entertainment here. Small, packed indoor arenas with great sound and lighting, an infield beer garden, livestreaming video capability, high quality scoreboards and a business model that focuses on sustainable revenue from cycling as the anchor tenant but is adaptable for other sports, concerts and special events. In the beginning, there is the need for only one – a league headquarters velodrome designed for entertainment where an entire season can be livestreamed to fans around the world. Others will follow and provide the all-important expansion model. The launch ingredients could be pretty simple, particularly when compared with the costs of starting a new league in more developed sports. In track cycling it can be done with less than 100 riders placed in league-owned male and female teams, a season of 12 fan-friendly events to follow, a model indoor velodrome and a visionary investor group. While the investment is sizable, the entire thing could be done in tranches and for far less than a small piece of an NFL franchise or the $100 million or so that has been invested by Americans in failed international road races, teams to compete in the Tour de France and legal fees to prosecute and defend American dopers. Plus, if structured right, it just might be possible for cycling fans to own a piece of a new, legitimate track cycling league that has multi-million dollar potential and the ability to add teams, venues and licensed programs. While this concept doesn’t neatly fit into the Olympic program, follow every UCI rule, embrace all the standard Olympic track races (many are boring and hard to understand), or even buy into the current Six Day format in Europe, it is a visionary but achievable solution for the dilemma of how to stimulate more interest in cycling and create a sustainable revenue base to support riders and grow the sport from the U.S. out. It stands to reason that, from such a base, can come more medal winners, new star athletes, renewed vitality and a viable economic model for American cycling. 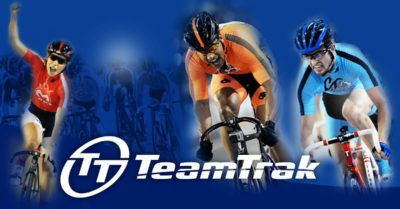 Check out the new TeamTrak® video!